...In the four hundred and eightieth year after the Israelites came out of Egypt, in the fourth year of Solomon’s reign over Israel, in the month of Ziv, the second month, he began to build the temple of the Lord." King Hiram of Tyre (980-950 BC) in Phoenicia had assisted David build the royal palace in Jerusalem by sending carpenters and stonemasons along with cedar logs from the Forest of Lebanon. (2 Samuel 5:11). Now with the ascension of Solomon to the throne Hiram sends ambassadors to congratulate him and to keep the doors open between Phoenicia and Israel for trade and peaceful relations. Solomon takes this opportunity to ask Hiram for help building the Temple. 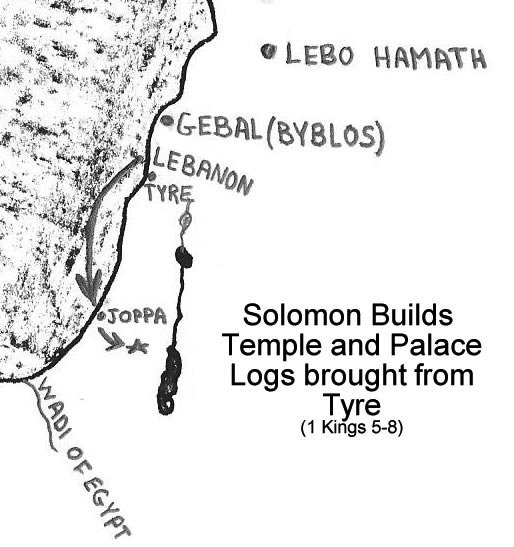 Hiram agrees to send the cedar logs down the Mediterranean coast to Joppa (Map). Do I trust the authenticity and accuracy of the Scriptures? If I do not trust the truth of Scripture what is my faith and assurance resting on? I will test the scriptures and seek confirmation of their historical accuracy and reliability as the trusted source of my spiritual confidence. 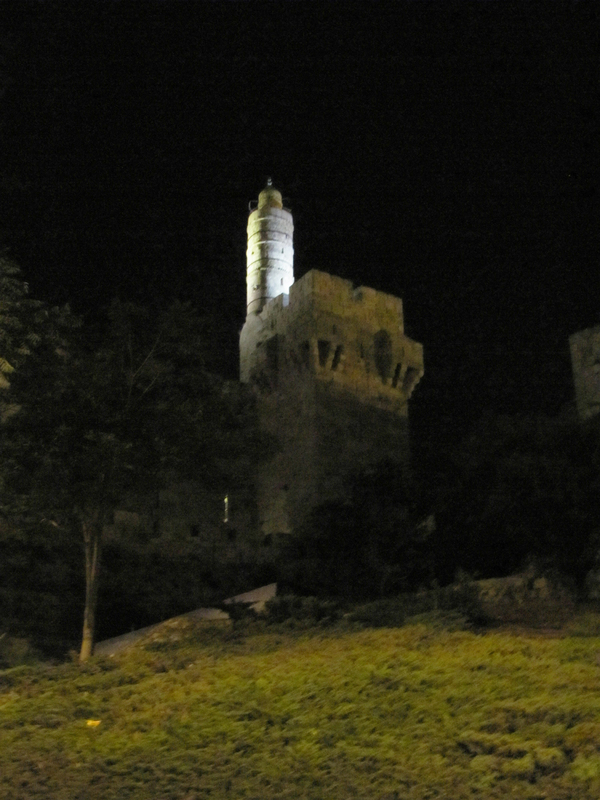 The "Tower of David" in the Citadel at night. 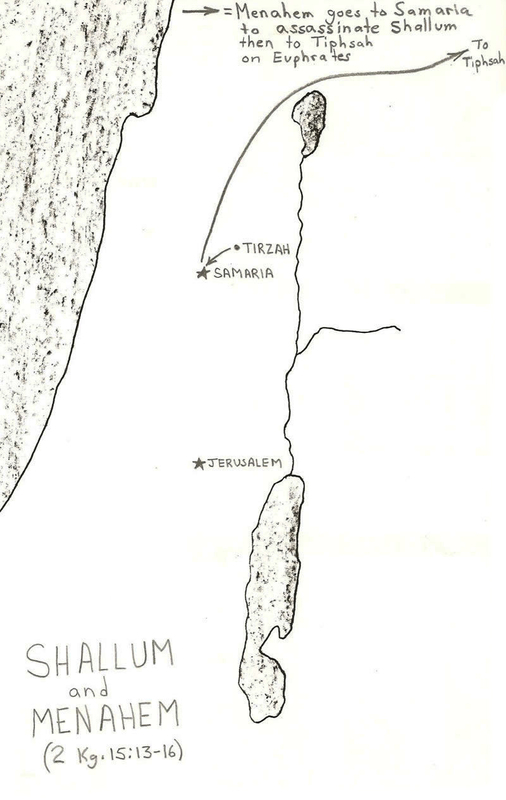 Details of Menahem's assassination of Shallum and flight to Tiphsah according to 2 Kings 15:13-16 on a map. Sanctification – from the Greek word αγιοζω which means “set apart”. The word is similar to holy, holiness, saint and sanctify. Three agents that bring about sanctification are: the Holy Spirit (1 Cor. 6:11; 2 Thes. 2:13; 1 Peter 1:2), the Son (Hebrews 10:10), and the Word (Truth) of God (John 17:17; Eph. 5:26). The bottom course of ashlar stone in the southwest corner of the retaining wall of Temple Mount is set on the cut and leveled bedrock of the Central Valley (Tyropoeon Valley). "Eloquent lips are unsuited to a godless fool— how much worse lying lips to a ruler!" Everyday you should sing, read, laugh and pray just like you should sleep and eat. 11 Now Hiram king of Tyre sent envoys to David, along with cedar logs and carpenters and stonemasons, and they built a palace for David. 6 In the four hundred and eightieth year after the Israelites came out of Egypt, in the fourth year of Solomon’s reign over Israel, in the month of Ziv, the second month, he began to build the temple of the Lord. 38 In the eleventh year in the month of Bul, the eighth month, the temple was finished in all its details according to its specifications. He had spent seven years building it. 8 So the Israelites did as Joshua commanded them. They took twelve stones from the middle of the Jordan, according to the number of the tribes of the Israelites, as the Lord had told Joshua; and they carried them over with them to their camp, where they put them down. 9 Joshua set up the twelve stones that had been in the middle of the Jordan at the spot where the priests who carried the ark of the covenant had stood. And they are there to this day. 25 Now Samuel died, and all Israel assembled and mourned for him; and they buried him at his home in Ramah. Then David moved down into the Desert of Paran. 18 Abigail acted quickly. She took two hundred loaves of bread, two skins of wine, five dressed sheep, five seahs of roasted grain, a hundred cakes of raisins and two hundred cakes of pressed figs, and loaded them on donkeys. 19 Then she told her servants, “Go on ahead; I’ll follow you.” But she did not tell her husband Nabal. 41 She bowed down with her face to the ground and said, “I am your servant and am ready to serve you and wash the feet of my lord’s servants.” 42 Abigail quickly got on a donkey and, attended by her five female servants, went with David’s messengers and became his wife. 43 David had also married Ahinoam of Jezreel, and they both were his wives. 44 But Saul had given his daughter Michal, David’s wife, to Paltiel son of Laish, who was from Gallim.